Invited by Technology Geelong for their inaugural ‘Lean In’ event, this presentation provided a jargon-free introduction to the concepts behind both the Internet of Things and Big Data. Designed to be an introduction to small businesses overwhelmed by emerging technology, the session provided clear, easy to grasp analogies to concepts such as sensors and actuators, and briefed the group on the basics of IoT security. If you’d like a copy of the presentation, or would like to know more, please don’t hesitate to make contact. 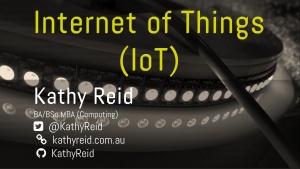 Invited by Technology Geelong for their inaugural ‘Lean In’ event, this presentation provided a jargon-free introduction to the concepts behind both the Internet of Things and Big Data.